Kaiju, literally translated, is a Japanese term that means “strange beast”. More generally, in the West, it is shorthand for “giant monster”. You might also hear “kaiju eiga”, which translates out to “monster movie”. It is a niche but surprisingly expansive genre. Take the story of ‘Colossal’, for example. After losing her job and boyfriend in New York, struggling Gloria (Anne Hathaway) moves back to her hometown only to discover how strangely connected she is to an enormous reptilian monster attacking Seoul, South Korea. 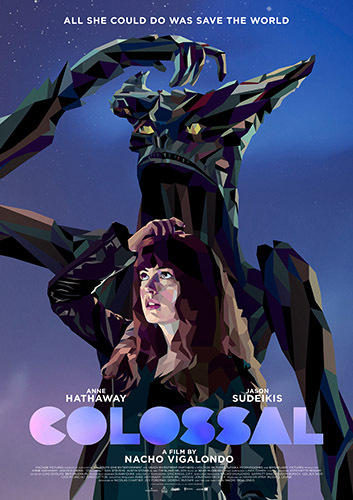 'Colossal' is the latest Hollywood film to tap into the growing resurgence of international interest in the kaiju genre - albeit with a very different spin on your traditional giant monster movie. Although the 1953 American film ‘The Beast from 20,000 Fathoms’ was the first live-action film to feature a giant monster awakened/created by an atomic bomb detonation, it is generally accepted that the first kaiju movie was ‘Gojira’ (1954). It largely defines the form for many fans: blokes in rubber suits, fire-breath, elaborate sets destroyed by blokes in rubber suits and fire-breath. The word “gojira” is simply a combination of the words for gorilla (“gorira”) and whale (“kujira”) alluding to its size, power and aquatic origin (although one popular story is that "Gojira" was actually the nickname of a plump stagehand at Toho Studios). The first ‘Godzilla’ (an American phonetic approximation of “gojira” created and trademarked by Toho Studios) movie tapped into Japanese anxieties about nuclear weapons and the Atomic Age. ‘Gojira’ hasn’t aged well in some respects, but the scenes of destruction hold up and there are moments to the movie that are shockingly dark: Ishiro Honda, the director, deliberately included images of destruction and aftermath that reflected the nuclear bombings. It also helped that, in some regards, it’s a well-produced movie - good luck getting the main theme, composed by Akira Ifukube, out of your head (it was later sampled extensively by the U.S. rap music community). Much of the score is equally as haunting. Most kaiju movies aren’t quite so heavy. In America, ‘Gojira’ was never released: it was heavily re-cut by the distributors, with Raymond Burr spliced in, and turned into ‘Godzilla: King of the Monsters’ (1956). Toho Studios began cranking out roughly one ‘Godzilla’ film a year between 1962 and 1975, with equally rushed editing and re-dubbing for American release to drive-ins and grindhouses. There were some efforts to make them more than just effects extravaganzas: ‘Mothra vs. Godzilla’ (1964) needles media sensationalism and environmental exploitation, albeit with some of the most racist depiction of “natives” you’ll see outside an old cowboy Western. The film is a kaiju fairytale of exquisite colour and fantastic imagery, and considered by most fans to be the apex of the series. The decline of the Japanese film industry and the resulting decision to focus the films on the children’s market didn’t help matters, artistically. The idea was to make something dumb and goofy for kids, leading to all sorts of odd decisions that were then chopped up. The movies were - and are - goofy fun and highly endearing not least because of their nature, but there was no interest (and more importantly no money) in making a more serious kaiju film. But like anything in pop culture, things shifted as fans grew up, became filmmakers, and began reinventing the franchises and ideas. ‘Godzilla, Mothra and King Ghidorah: Giant Monsters All-Out Attack’ (2001), for example, is a movie with a silly title, but a surprisingly gritty tone that returns Godzilla to being a serious menace. ‘Big Man Japan’ (2007) is a bittersweet and smart mockumentary that rips on Japanese pop culture and satirises the tropes of kaiju movies while also serving as a unique and clever kaiju film in its own right. Leaving aside Roland Emmerich and Sony Pictures' misguided attempt to bring ‘Godzilla’ to the U.S. in 1998 and Peter Jackson’s yawn-inducing ‘King Kong’ remake in 2008, it wasn’t until director Matt Reeves’ ‘Cloverfield’ arrived that kaiju films began to come back in a big way outside of Japan. With ‘Cloverfield’ (2008), producer J. J. Abrams conceived of a new monster after he and his son visited a toy store in Tokyo while promoting ‘Mission: Impossible III’. He explained, "We saw all these Godzilla toys, and I thought, we need our own [American] monster, and not like King Kong, King Kong's adorable. But I wanted something that was just insane and intense". By cleverly utilising the cinema verté style that so many other found footage movies fumble at creating, ‘Cloverfield’ captured the narrow perspective of the people underneath the kaiju’s feet. The effect was reminiscent of the earliest Toho monster movies before the Japanese studio softened Godzilla’s image in favour of a family-friendly character. The suddenness with which the unnamed beast in ‘Cloverfield’ attacked was stunningly disorienting, because the home-movie-within-a-movie actually felt like that: an awkwardly-made video overseen by an emotionally tone-deaf friend prior to a going away party. Travis Beacham, who wrote the screenplay for ‘Pacific Rim’ (2013), conceived the idea while walking on the beach near Santa Monica Pier, where he imagined a giant robot and a giant monster fighting to the death. "They just sort of materialised out of the fog, these vast, god-like things." Director Guillermo Del Toro’s love letter to the kaiju genre had it all: bizarre, monstrous Lovecraftian entities, a dimensional rift in the bottom of the ocean, gigantic manned robots, Ron Perlman, and massive punch-ups between the kaiju and the automatons in devastated city streets. The sequel, ‘Pacific Rim: Uprising’, directed by Steven S. DeKnight, is scheduled to be released in 2018 via Universal Pictures. The first ‘Godzilla’ movie tapped into Japanese anxieties about nuclear weapons and the Atomic Age. The “MonsterVerse” is a shared fictional universe that is centred on the latest American monster films featuring Godzilla and King Kong, distributed by Warner Bros. and produced by Legendary Entertainment in partnership with Toho (for the ‘Godzilla’ films). The first instalment was ‘Godzilla’ (2014), a reboot of the Godzilla franchise, which was followed by the recent ‘Kong: Skull Island’ (2017), a reboot of the King Kong franchise. The next film to be released will be ‘Godzilla: King of the Monsters’ (2019), followed by ‘Godzilla vs. Kong’ (2020). Back in Japan, ‘Shin Godzilla’ (2016) was directed and written by Hideaki Anno and Shinji Higuchi, two of the key architects behind influential anime series ‘Neon Genesis Evangelion’ (itself an inspiration for ‘Pacific Rim’). The film was the 31st instalment in the ‘Godzilla’ franchise, the 29th ‘Godzilla’ film produced by Toho, and Toho's third reboot of the franchise. Drawing inspiration from the 2011 Tōhoku earthquake and tsunami and resulting Fukushima Daiichi nuclear disaster, the film revealed itself to be as much a full-blown satire of Japanese politics as a monster movie. During an interview with J.J. Abrams to promote ‘10 Cloverfield Lane’ (2016), he said the creative team behind the original had some ideas on developing ‘Cloverfield 2’, but the release of Edwards’ ‘Godzilla’ and Del Toro’s ‘Pacific Rim’ led them to abandon them as they found the concept of kaiju movies played out. With due respect to Abrams, it is unlikely that the kaiju genre will ever be completely exhausted – not when films like 'Shin Godzilla' and 'Colossal' continue to reinvent and twist the familiar genre tropes into interesting new shapes. Besides, on a base level, there will always something appealing in watching giant creatures destroy cities, making we mere humans feel like helpless ants (until a scientist discovers a convenient weakness). The kaiju genre is, in many ways, as durable and unkillable as the giant radioactive lizard that serves as its poster boy. Competition opens at 5pm AEST on Sunday 2nd April 2017 and closes at 11:59pm AEST on Sunday 9th April 2017. Five winners will be chosen at random on Monday 10th April 2017. To successfully win, entrants must fulfil the above entry conditions before the time the competition closes. Current members/followers are eligible to enter the competition. Only one entry per person. Only one winner per household. To be a valid winner, the entrant must not have won a prize from SWITCH within the last 28 days. Each winner will receive one double pass to 'Colossal'. By entering, you agree to receive occasional emails from SWITCH in the future. If you decide to unsubscribe from these updates, any further entries will not be applicable. Only Australian residents are eligible to enter. Not valid public holidays. Not valid on cinema discount days. Valid even with No Free Tickets. Not valid on Saturdays after 5pm. Subject to availability. This ticket must be taken as offered and is not exchangeable, for sale, transferable or redeemable for cash. Not valid at Village Cinemas Gold Class, EVENT Cinemas Gold Class, Vmax and 3D, Greater Union and Birch Carroll & Coyle Gold Class, Vmax and 3D, Reading Gold Lounge, 3D or Titan XC, Hoyts La Premiere, Directors Suite, Bean Bag Cinema, Xtremescreen or IMAX®, Nova Deluxe, Avalon, Collaroy and Warriewood cinemas, Cremorne Orpheum, Roseville Cinema, Camelot Outdoor, Movies in the Vineyard and Luna Outdoor, State Cinema Hobart, Graceville Twin, Dendy Premium Lounge or Dendy Lounge Cinemas. 'Colossal' is in cinemas from Thursday the 13th April 2017 through Transmission Films.